Tanner Matteus signs a Letter of Intent to play football for Benedictine University while his parents watch in approval. 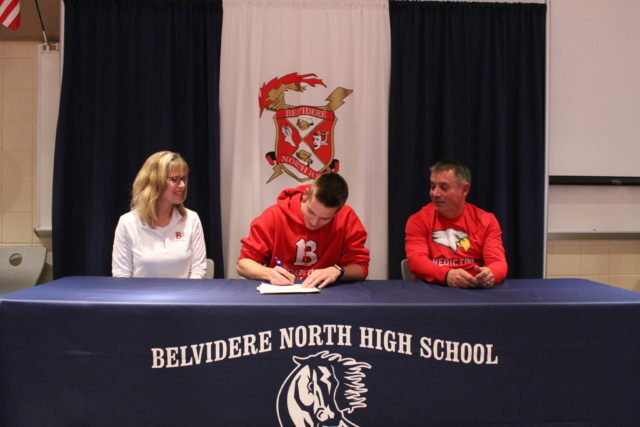 A select group of people gathered together on Wednesday, March 20 to celebrate Tanner Matteus as he signed a Letter of Intent to play football for Benedictine University. While attending Belvidere North High School, Tanner played both football and soccer all four years. He became a three-sport athlete, adding volleyball for his sophomore, junior, and senior years. He was a NIC-10 Scholar Athlete all four years. He was the MVP Special Teams, NIC-10 All-Conference Kicker in his sophomore and senior years and the MVP Special Teams, NIC-10 All-Conference Punter his junior year. He carries a 4.0 grade point average, earning the place of valedictorian this year. He is an ACES Scholar (Students follow a comprehensive curriculum combining honors level courses and rigorous Advanced Placement level course work. The course of study provides students with a broad background in all the scientific disciplines at levels appropriate to talented and motivated learners. ), a Mantle Award winner, and an Illinois State Scholar. His extracurricular activities include Science Olympiad, Scholastic Bowl; All-Sectional, as a junior and a senior; National Honor Society president; Science National Honor Society member; ENHS member, W Club, and N Club. 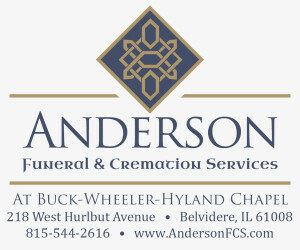 For complete article, pick up the March 28 Belvidere Republican.